Notes along the Journey: I don't know what to do. A great multitude came against Judah for battle. Overwhelming disaster seemed unavoidable. How can Judah overcome? What to do? I love how they stood in front of the temple and declared the promises of God. They reminded themselves of God’s power and provision. How will we respond when our backs are against the wall? When life is chaotic? Tomorrow seems so uncertain. I don’t know about you, but I’m well acquainted with this feeling powerless. I’ve felt this just a few weeks ago. I had a bombshell lobbed at me concerning my job. I was transferred to another department. And not where I wanted to be. I had no choice in the matter. I was wrenched emotionally. I could see change ahead on the horizon and I was afraid. But my eyes are on You. 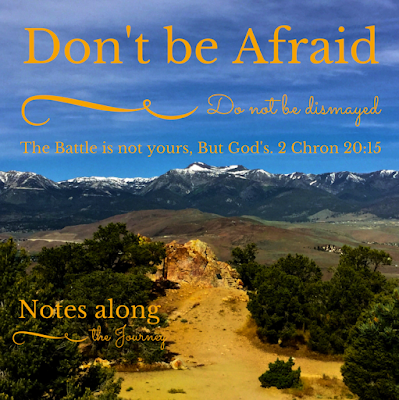 God spoke to Jehoshaphat and the people of Judah, “Don’t be afraid, Don’t be dismayed at this great horde, for the battle is not yours, but God’s” “You will not need to fight in this battle. Stand firm, hold your position, and see the salvation of the Lord on your behalf.” Needless to say, God fought for Judah and a great victory was won. A month ago I sat in a meeting afraid, angry and shocked at what was happening. It was nowhere on my radar that all this was about to happen. Ironically, I was studying this chapter for my Sunday School class before all this went down. It was an ugly situation. But God...I love this. Insert Almighty God in the situation and watch what happens. I stood firm and sought His face. In a week after this meeting at work, I had a new job. My life is different and change can be a bit scary. He has been with me every step of the way. He kept me strong. Beloved take this to heart. He will not leave you. He will fight your battles. He is sufficient. Do you feel powerless today? Have no clue what to do? Look to your Almighty God. Trust Him to take care of you.